Ughhh, so much pizza… I don’t think I’ll ever eat it again! 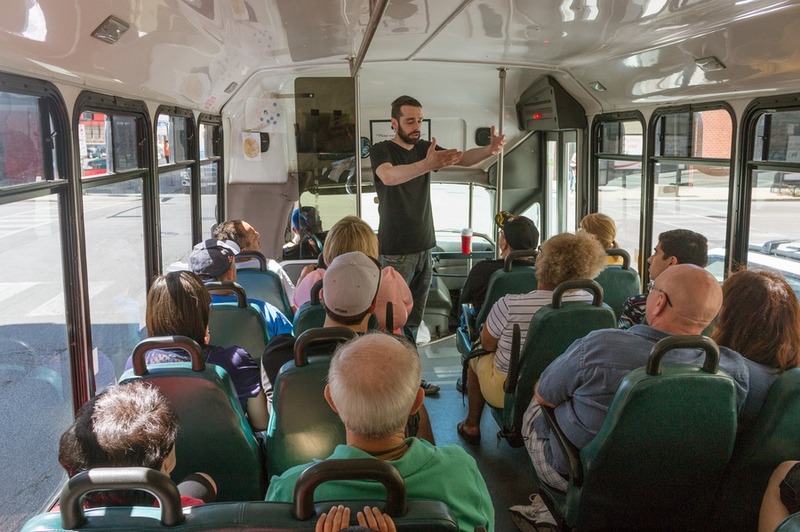 My pet hate is a food tour that leaves you hungry at the end. You skip breakfast and eagerly make your way to your food expedition only to be searching for another eatery after it’s all over. It’s the taste of disappointment. Literally. We’ve done our fair share of food tours in Athens, London, Rome, Kuala Lumpur and many other international destinations, and we’ve developed a justifiably high expectation when it comes to food tours. 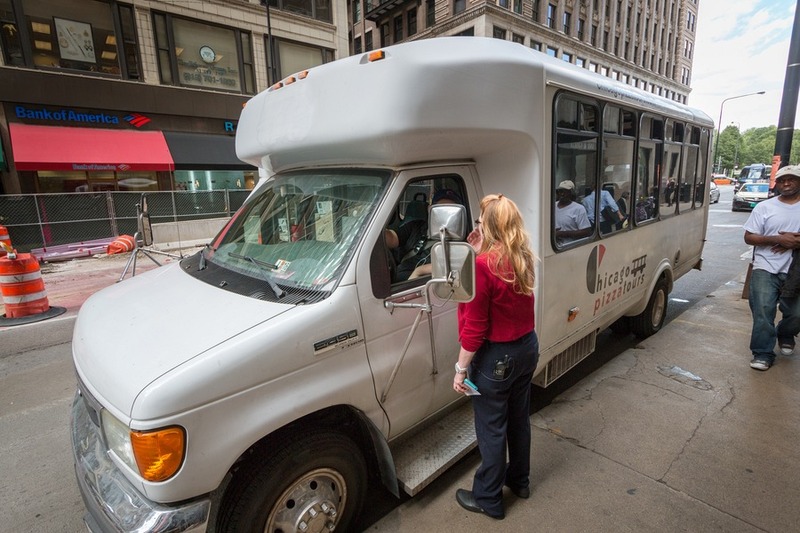 I looked through a few food tours Viator offered and when they invited us to try the Behind-the-Scenes Chicago Pizza Tour by Coach we thought it sounded like a winner. Dragging tired kids on a walking tour can be tough, so the idea that we could glide around by mini-coach was appealing. Plus it was all about pizza. How could the kids not be in love? We met our guide at Pizano’s. Located a few minutes walk from the iconic mirrored bean sculpture in Millennium Park, this pizza restaurant happens to be Oprah’s favourite. Not to mention it has won numerous awards and been featured on TV, in magazines, newspapers and anywhere else pizza has ventured. The time was 11am. We were hungry and ready for mouth-watering pizza. For over 1 month we had pizza fasted in preparation for this moment. Consider it the equivalent of a top athlete training for their world championship moment… except our training simply involved doing nothing… and then eating. Anyway, as we walked in the smell was intoxicating, filling the dining room with spicy pepperoni, aromatic mushrooms and the ever-delicious whiff of melted cheese. Could they slice those little beauties any faster, please? 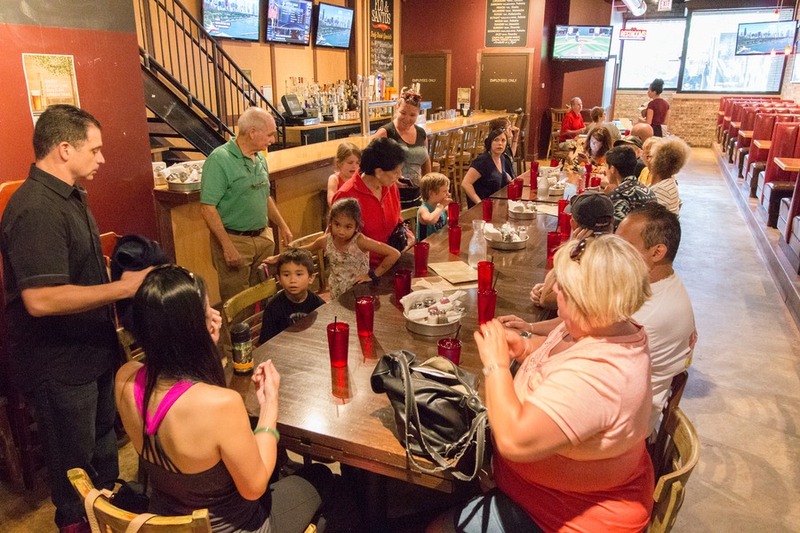 We regaled our group of fellow pizza lovers with travel stories before a hushed silence fell upon the table in anticipation. A small plate piled with pizza was placed before each of us. 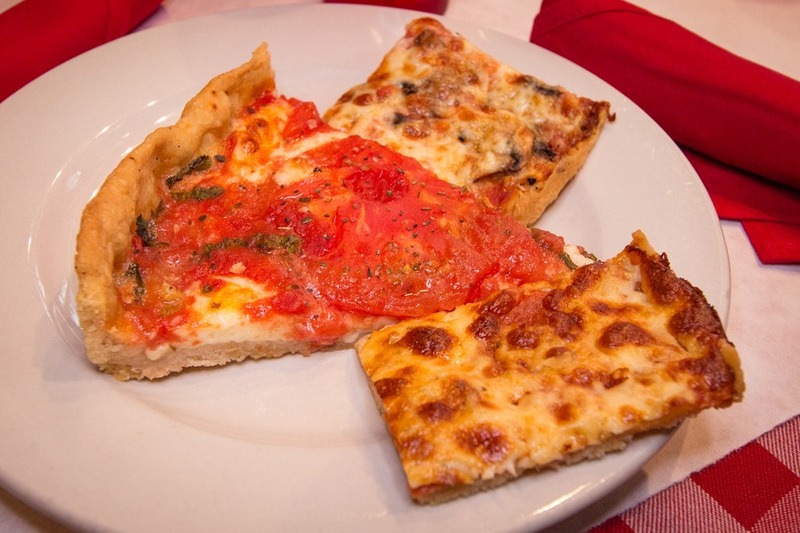 1 super-sized slice of traditional deep-dish and 2 thin and crispy tavern style squares. 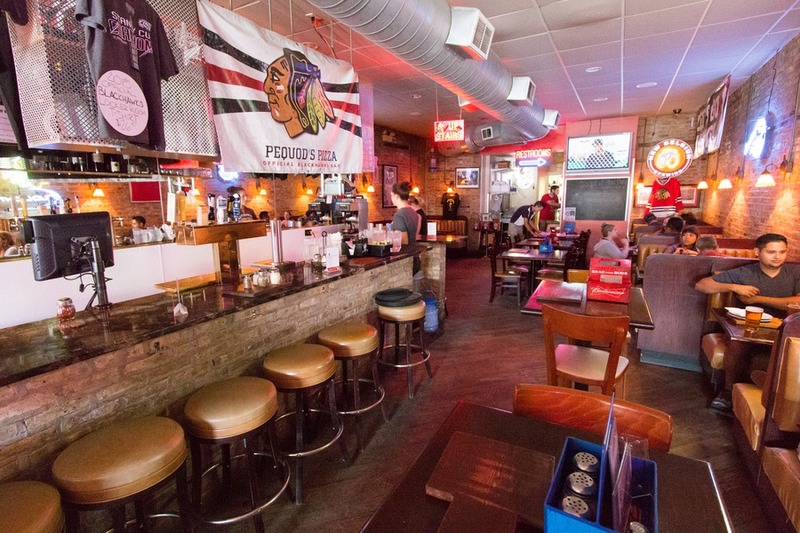 Pizano’s is renowned for Chicago’s iconic deep-dish pizza. This particular interpretation was almost a quiche or pie. The savoury crust was crumbly like a biscuit, filled with a thick layer of melted cheese, basil and smothered on top with tomato slices and rich tomato sauce. 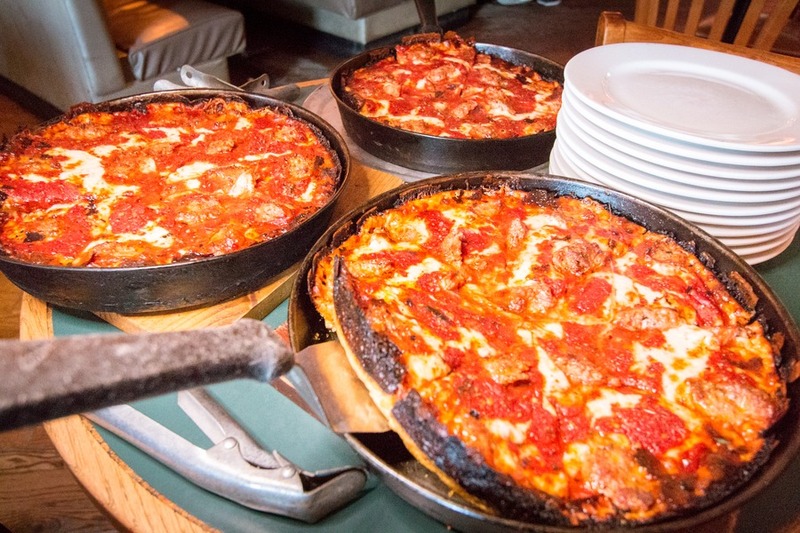 Chicago locals rarely eat the deep-dish, and save it for special occasions or to impress out-of-towners. It was a heavy pizza with a considerable amount of cheese that was sure to send me into a lactose-induced comma. It was a tough choice, but I found myself favouring the tavern style thin crust, also invented in Chicago. 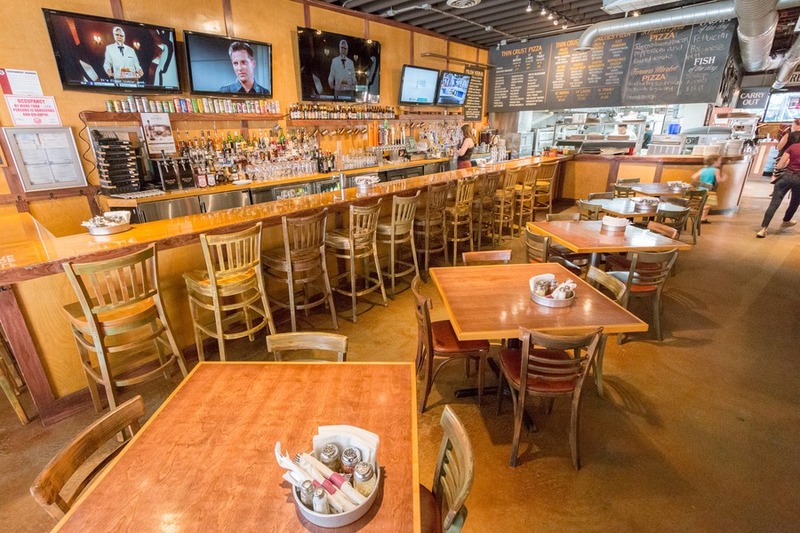 Way back in the day when workers hit 5pm they headed to the tavern for a beer. It wasn’t a long stay, as they soon got hungry and retreated home for dinner. 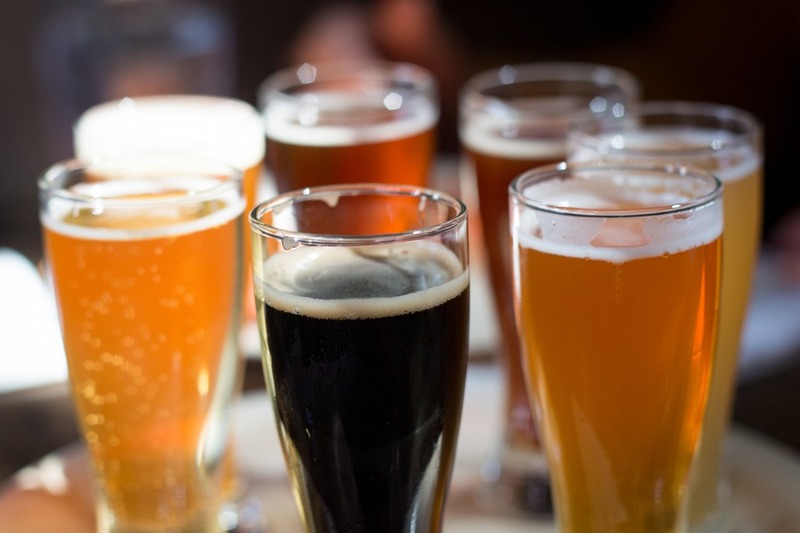 Wanting to sell more beer, tavern owners decided if they could serve something to eat at the tavern the workers would stay longer. Pizza was the perfect answer, salty enough to inspire another drink, and cheap enough to give away for free. Well, the pizza is not free anymore, but its still super thin and still served in squares. Both the peperoni and mushroom were mouth-watering. 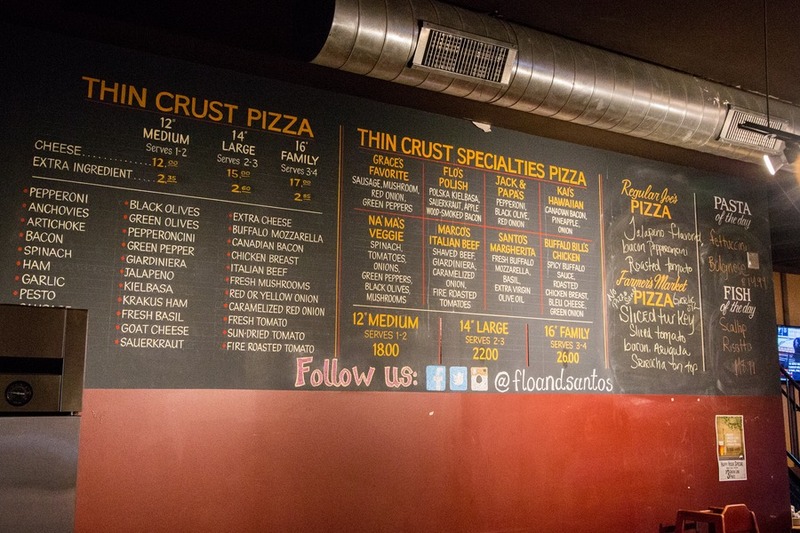 It was just a short drive south to Flo & Santos where we were seated at large table ready for our next pizza slices. 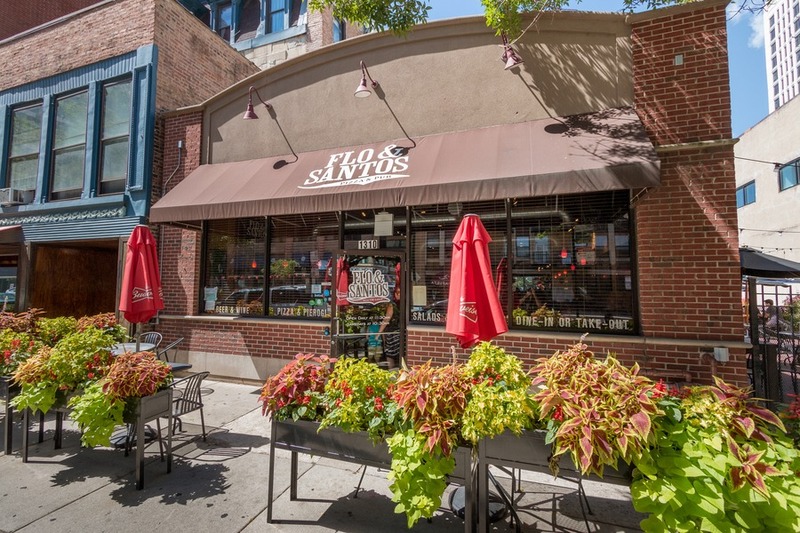 Two squares were presented to us – one with Polish sausage and the other with Italian beef. The Polish sausage was delicious and even as a non-fan of sauerkraut I found it tasty. The Italian beef, which is not actually from Italy, had a real spicy punch to it. 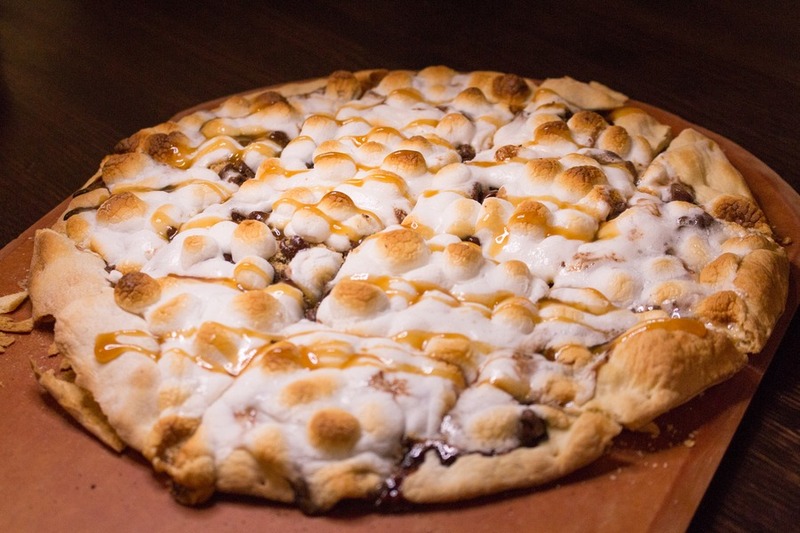 Our kids spotted the Smor’es dessert pizza before anyone else and squeals of glee ensued. Melted chocolate and soft gooey marshmallows on a crusty pizza base. What part of heaven did this fall from? This sweet treat was the highlight of my Flo & Santos experience. 6 slices down and we were only half way through the tour. Clearly I wasn’t going to be going hungry afterwards. I could tell we would not to start loosening our travel pants. Our next drive was slightly longer and our guide, Danny, filled the time pointing out historic building and points of interest in his thick charming Chicago accent. 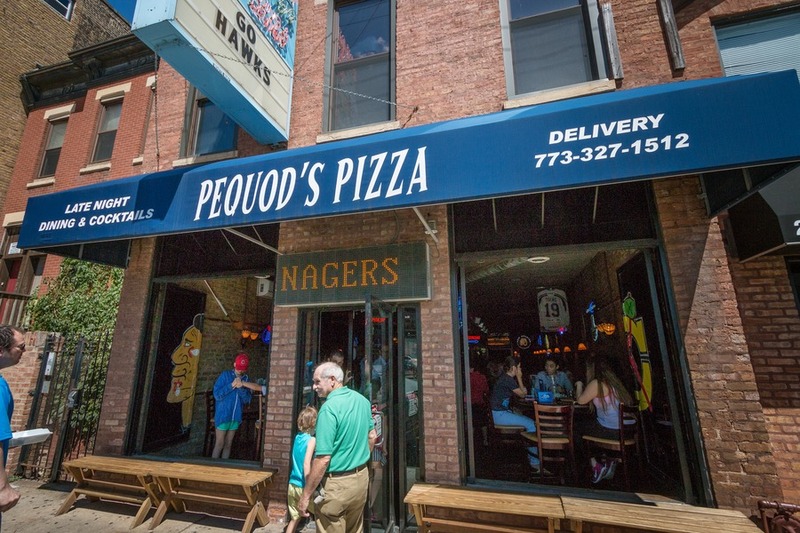 Next stop was Pequod’s Pizza. If you’ve ever watched Man Vs Food (I love it! ), this is Adam’s choice for pizza whenever he’s in Chicago. The deep dish here was incredibly different to the first. The base was thick, fluffy dough that almost seemed to be too big for my mouth. I found it hard and awkward to eat, but “Jaws” Josh didn’t. The highlight, however, was the unique blackened caramelised cheesy crust. Don’t be fooled by the charred appearance, it’s meant to be like that and is a delight. I was failing. I didn’t think I could fit one more piece in. But one more piece was on the menu at Piece. 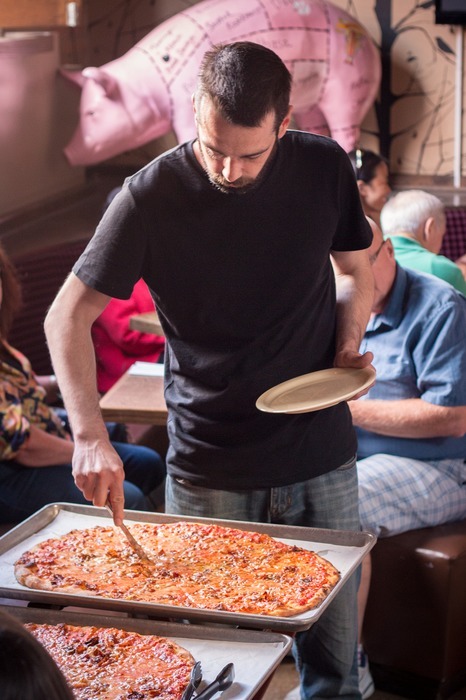 Pizza Today magazine named Piece the best independent pizza restaurant in the country. 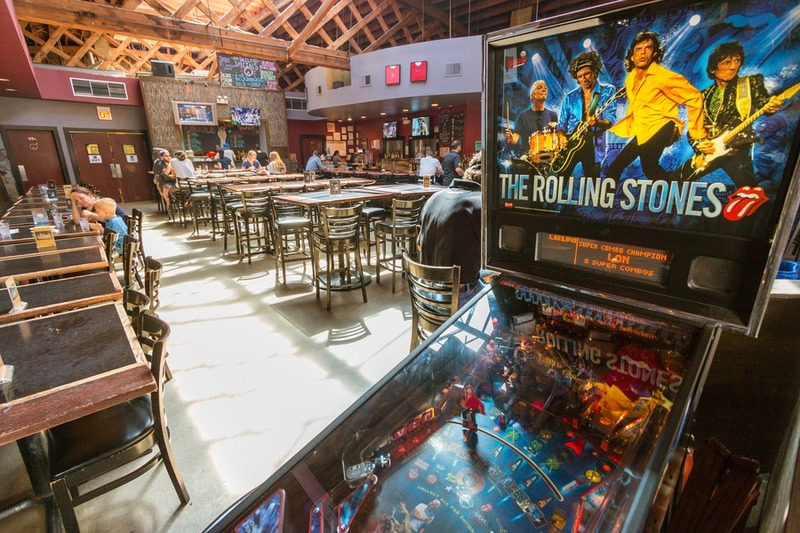 And it helps that Piece also operates an in-house brewery for pizza’s best accompaniment - beer. The kids had reached their maximum capacity by this point and I found I couldn’t squeeze that last piece in. Thin crust with bacon and cheesy goodness stared at me with a victorious smirk. We popped our slices in a takeaway box and had dinner sorted for that evening. How could I ever eat pizza again? I was so full and pizza-ed out. I was sure I’d never lay eyes on pizza again, let alone eat it. Except that night we went to a White Sox baseball game and the Piece leftovers were put to good use. We were returned back to Pizano’s and disembarked to roll back home like a handful of doughy spheres. With all those extra calories sitting in my stomach we took the opportunity for a brisk walk around Millennium Park and tried to reach the 10,000 step target on my Fitbit. You will not go hungry on this tour. It’s packed with gooey cheese, spicy sausage, tantalizing tomato sauce and a seemingly never-ending supply of pizza. 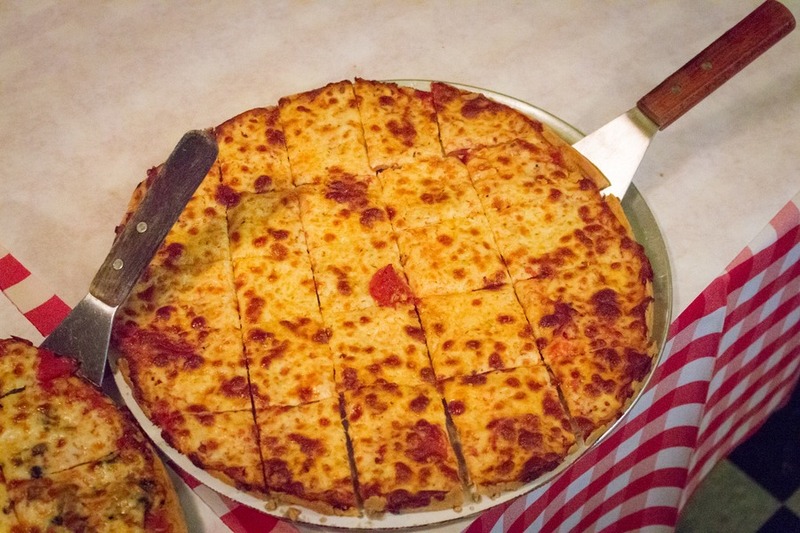 If you are looking for a true Chicago pizza experience I would easily recommend this tour. Just don’t expect to eat pizza ever again… Well, at least until those leftovers beckon. Buy one get one pizza free!!! !